I have to say I am struggling at the moment. Not in terms of depression or mania. Not in anxiety or stress. But from pure exhaustion. I’m struggling to understand whether the exhaustion is mental or physical. Medication induced or cumulative from the hell last year was. All I know is that I crave my bed at times of the day when I shouldn’t. The early morning enthusiasm I have always possessed has deflated into a bleary eyed being going through the motions. Sometimes, and I know this is bad, I choose not to eat because the very thought of preparing lunch exhausts me. I’ve tried experimenting with my medications. The anti-psychotics are my biggest suspect. Naturally, though, when I skip my dose I end up awake all night. My insomniac ways back again. This I could put up with, but the symptoms of dissociation the following day I can’t. So I take the pills again, and continue wading through my days. This just wont do though. 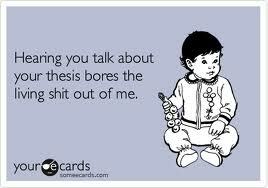 Despite the fact that I have an active toddler to care for and a house to run, I also have a thesis to write. Yet I stare at the page, immersed in a cloudy brain fog, wondering if I will ever possess the mental strength to finish it. It annoys me. All that time spent researching, waddling into uni eight months pregnant to meet participants, meetings, leaving behind my eight week old baby to run classes and collect data at uni, hours fighting with my statistical software, ….all that goddamn dedication, and now I can’t find it in me to do the best, easiest, most rewarding part! “You” my supervisor said a few months ago, “have worked so hard on this. You have put much more work into this than the average student. Now you just need to get your act together, write the darn thing and get the mark that you deserve”. I’ve made a start I suppose. I sat down today, reread the 19 pages I have already written. I read a few key journal articles. Corrected a few mistakes. Forced myself to sit at my desk, put on my glasses (because that surely means business!) and just get on with it. I haven’t achieved much, but it’s more than yesterday, and I suppose that is what counts. I’ll chip away at it. A bit here, a bit there, and hopefully one day I will be surprised to find a finished product. Over the last few years I think I have tortured those around me enough with my thesis. “It’s hideous! I actually think it may kill me”, punctuated with a dramatic flop onto the floor (much to the alarm of the family dog). An epiphany three hours later where I talk with great excitement about “the most interesting thing I have learned all week. Potentially all year. But let’s not get ahead of ourselves yet.” Yes, it’s a love hate relationship. A bipolar state within itself. I’m not the first and won’t be the last to feel this way. Enough is enough, and I must get it done. As for the exhaustion, it’s still here. I’m hoping it’s merely a medication glitch that can be dealt with at my next appointment. If it’s a psychological thing – I guess I just have to keep riding this wave.